VK Series – Gaska Tape Inc. Both products are coated on each side with an aggressive high performance S3 solvent acrylic pressure-sensitive adhesive and covered with a 5 mil blue polypropylene film liner. Can also be used in a wide variety of other applications that previously relied on costly high density urethane gaskets for spacing, vibration dampening or cushioning. Compatible with most chemical cured silicone sealants. 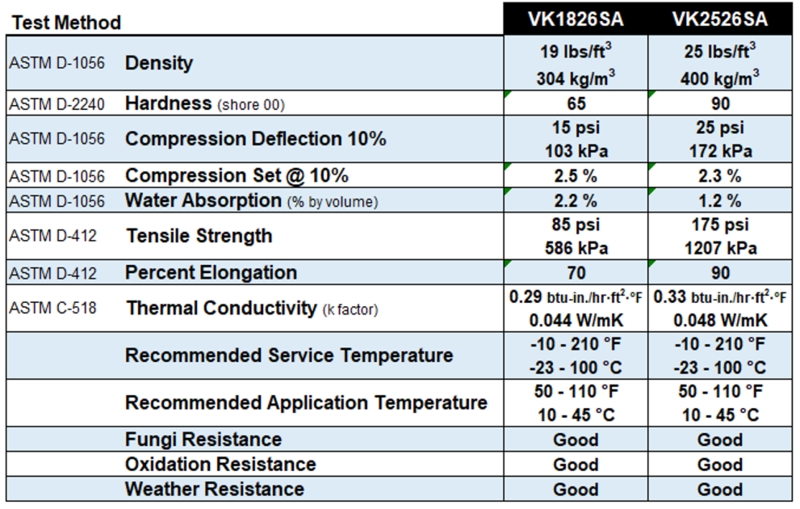 VK Series spacer materials have a six-month shelf life on Solvent Adhesives. VK Series offers a good balance of peel strength (PSTC-1) at 2 lbs./linear inch and shear strength (PSTC-7) at 30 hours. VK Series is a cost effective substitute for polyurethane foam substrates. VK Series also offers good adhesion to stainless steel, glass, aluminum, painted metal and vinyl. It is a cost effective and viable gasket option for a variety of other industries including industrial equipment manufacturing, automotive glass/windshield and building construction. NOTES: Gaska Tape VK Series spacer has a six-month shelf life on Solvent Adhesives.